Notes: Based on the light novel series by Yasichiro Takahashi, which ran from 2002 until 2012. In a collaboration with artist Ayato Sasakura, the author later adapted his own series into a manga, which ran until 2011. 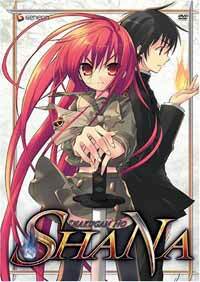 A standalone OAV entitled Shakugan no Shana: SP was released several months after the TV series came off the air. It is basically a fanservice-oriented hot spring episode whose events take place after those of episode thirteen, although they have little bearing on the main story. This OAV is treated as part of the first season here and included in this review; hence why we list there being twenty-five episodes in spite of only twenty-four being aired. One day, Sakai Yuji, a high school student who had expected his normal life to last forever, finds out that he has in fact been dead for some time. While on his way home, he witnesses a shocking view as the world suddenly freezes, with people being engulfed by blue flames and a monster resembling a large doll swallowing them. Just as the monster prepares to consume Yuji, a sword-wielding girl with flaming red eyes and hair that burns like embers saves him. The girl calls herself a "Flame Haze" who hunts the "Guze no Tomogara", creatures from another world. As Yuji notices a blue flame in his chest, she calls him a "Torch" or temporary replacement, saying that the "real" Yuji's existence has already ended. Unfazed, Yuji befriends the strange and nameless girl, nicknaming her "Shana" and joining her fight against the Tomogara. Sometimes, I feel that it is a shame that I did not watch an anime series while it was airing, and such is the case with Shakugan no Shana, the popular adaptation of a fantasy and action-oriented light novel. Given that I have found some similar shows to be heavy with fanservice, drawn-out battle scenes, and insufferable cliches and light on depth (Kaze no Stigma being one example), it was not a series I especially expected to like, and its languid pacing and long expository opening tested my patience for some time. Shakugan No Shana, however, manages to survive a rocky start and evolves into a thoroughly entertaining story, albeit a persistently insubstantial one. Shakugan no Shana is a series that was designed to be suspenseful, in that relatively little is given away in each episode such that the viewer is, presumably, dying to see next week's entry. This is especially noticeable early on, where little in regards to what the Flame Haze actually do is clear until episode five or six, the first real villain hardly comes into the story for that same amount of time, and at most three or four important facts about the setting emerge per episode. Any show in which a "normal" character is thrust into an abnormal world is likely to have a slow opening, but outside of a well-choreographed battle that straddles episodes one and two, the show is somewhat tedious to watch for almost a quarter of its run because of this meandering pace. It doesn't help especially that the arc of the first villain, a suave "puppeteer" Tomogara, is by far the least interesting one, since he is visible for such a short time, his personality is limited to him acting in a generically evil fashion, and none of the revelations that do occur in that period emerge from Shana's battles with him, making him seem like a superfluous figure just when the show is in desperate need of purpose. Indeed, this slowness is also apparent in the large amount of time that Shakugan no Shana devotes to building up to its battles, and while this is not stretched out to an insufferable extreme there are perhaps two episodes of buildup for every episode of action. This is not something I necessarily mind, for in many fantasy series it allows time for world-building and gives the viewer the chance consider what the series at hand is trying to say and what subtext may be drawn from its plot. The backstory of Shakugan no Shana, however, boils down to the tale of a long-running war between opposing supernatural armies, one that intends to upset the balance of the world for its own gains and another that seeks to stymie this, and this far in the franchise there is little to indicate that its plot serves any purpose besides the obvious, meaning that the slow episodes accomplish very little. The series' magical elements, at least, are not as arbitrarily constructed as I feared they might be, a few "awakened powers" that conveniently emerge in dire times notwithstanding, but this show's fictional universe isn't a masterpiece of imaginative storytelling by any stretch, and as a result of that Shakugan no Shana begins to fall apart whenever the pace slackens. These criticisms aside, there is much to like about Shakugan no Shana, and these positive aspects become much more apparent when it is no longer trying to find its feet. When the exposition ceases, the pace picks up somewhat, and much to its benefit the show abandons what is shaping up to be a "villain-of-the-arc" structure in favor of a troupe of recurring figures whose reasons for wanting to destroy "existences" make some sense and whose personalities are far more dynamic. Meanwhile, the characters of Yuji and Shana, neither of whom are anything besides plot devices at show's onset, evolve to a point where their relationship is essential to the story, their personalities crucial to the show's charm. It is an interesting case of characterization and plot complementing each other well: neither of the two would win awards for characterization and the plot is similar to those of many other shows, but without their relationship the plot would rapidly lose steam, and vice versa. Yuji wastes little time despairing is status as a "Torch" and instead tries hard to make himself useful to Shana by training to fight alongside her, and although he does manage to help her out, he does not have a dramatic moment in which he is suddenly able to fight perfectly (as happens in far too many shounen series), nor does he slacken. He instead works persistently to the point where Shana's view of him and other humans, whom she had previously viewed as weaklings deserving of little regard, is altered. Shana, for her part, is a far more interesting character than her tsundere role would seem to indicate; although her tantrums are awful when they do occur, her sour personality is fitting given her lonely and arduous existence and the moments in which it is taken to an extreme are mercifully rare. She is, luckily, not relegated to a supporting role as are many female characters in these shows, but instead, it is her fighting ability rather than Yuji's that constitutes the focus of the series. His companionship does soften her personality, in a far less blatant and rapid manner than occurs in other shows with tsundere characters, but he does not supersede her importance or make her appear incompetent, instead becoming a raison d'etre that was previously absent, motivating her to fight, and visibly improving her skill. I will admit that this is cliched in principle, but it is presented as a undertone more so than it is explicitly spoken, which renders the progression of this relationship into one of the most nuanced aspects of the show. Shakugan no Shana also benefits from a solid side cast whose personality archetypes, while present, don't overshadow their ability to constructively participate in the story. Most of the peripheral classmate characters, none of whom I really disliked, do eventually become involved in the central plot, with mixed results in regards to the smoothness of this process. I did appreciate the manner in which a pair of apparent class clowns stumble upon a rival Flame Haze of Shana's, the voluptuous and ever-intoxicated Margery, and in humorous fashion became her "henchmen" (a role that more or less involves paying for her booze) before eventually becoming invaluable, but Yuji's polite and soft-spoken classmate Yukari, who does little beside hope for his affections during the first half, is brought in when another Flame Haze appears and explains the world to her after deciding that she is the best for "grounding him in this city" (whatever that actually means). Nonetheless, I liked the supporting cast on the whole, which, given the lack of narrative depth and weakness of the comedy, did help me get through some of the series' duller episodes. The character design is not especially interesting, with the quality of the art being hit-or-miss, but when the show does depict a battle the animation budget inflates dramatically, and those scenes are quite well-done, the sum of these parts making for a good if not great presentation on the whole. I liked but didn't love the musical score, a low-budget production consisting of piano pieces and synthesized orchestral themes, but I did have a soft spot for the first pair of theme songs, with the intense and passionate ED cleverly segueing out of each episode's climactic events (the second pair of theme songs is fine, but there was no reason to make the change). In short, I liked Shakugan no Shana a lot more than I expected to, and while it suffers from a general lack of substance and uneven pacing there's a very good chance that I will watch the ensuing seasons. The conclusion of this season is clearly intended as a bridge to the next portion of the story rather than a definite ending of any sort, and this series is designed for those who will stick with it; I'm personally optimistic that the rest of the show, no longer needing to muddle itself with dry exposition and having already established its conflict, will improve. If you're not interested in fighting-based anime then this won't change your opinion, but I would recommend it to everyone else as a good diversion. Recommended Audience: Fine for teenagers but probably not for kids. There is violence throughout, although hardly any of it is at all graphic. There is also a fair amount of fan service (mostly directed at a male audience), especially in the OAV episode.